A few years ago, I read a series of articles about the Vatican’s plan to reconcile the Galileo affair. The decision to reach this important milestone was by no means a hasty one; it was concluded after the Pontifical Academy of Sciences (the church’s leading scientific minds) deliberated every aspect of the case for almost 13 years. To the average person, pondering a question for 13 years may seem a bit excessive, but when dealing with a 400 year old grudge, you can’t hurry love, you just have to wait. Net-net, I was delighted to witness the curtain descending on this, the final act of one of the saddest episodes in the history of science. In a follow-up article I read that the Vatican was even prepared to go one step further. In a gesture that could only be described as brotherly love, they were planning to immortalize the father of modern science by erecting his statue near the apartment where, in 1633, he was incarcerated while awaiting his inquisition trial. This was getting better and better. So, on a recent trip to Rome I decided to seize the opportunity and drop by the Vatican to pay my homage to Mr. Galilei. 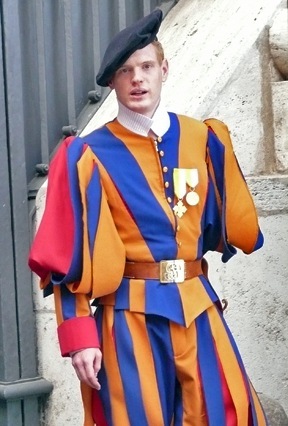 Not being familiar with the neighborhood, I consulted one of the Swiss Guards for guidance. The soldier, in a somewhat disinterested voice, informed me that there was no statue of Galileo in the Vatican. Here, I thought to myself, was an opportunity to one-up the Swiss mercenary guard. “Haven’t you heard about the Pontifical Academy of Sciences and the decision to erect the statue?” “Oohh, that?” he replied, “that project was canceled“. I have to admit that at first I suspected my guard friend was out of the loop, but after performing a quick internet search on my phone I confirmed that indeed, the Holy See had decided that the funds originally allocated to the project were re-appropriated instead to an African educational program aimed at teaching about the interdependency of science and religion. Clearly the hand that gives can easily take away; but why? Why would the Vatican go through all the trouble of 13 years of meetings, making news announcements, and publicly committing to erect a statue no less just to renege at the last moment? Last week, as I was rummaging through some magazines I fell upon an article written by Father Jose Funes, the Jesuit director of the Vatican Observatory. In the article, Father Funes theorized that if aliens existed, they were absolved from redemption because, contrary to us sinful humans, they were already in “full friendship with the creator”. After rubbing my eyes and rereading the article a few more times, (it read like something Father Ghido Saraduci might have written), the answer to the whole Galileo affair finally came into focus. The explanation for the church’s apparent Dr. Jekyll and Mr. Hyde personality disorder had nothing to do with Galileo being right or wrong or the validity of any specific theory. 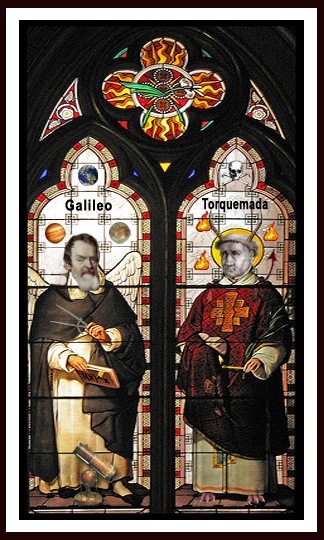 At the core of the issue were the Pandora box that Galileo unlocked and the resulting devastation the scientific reasoning unleashed on the church’s authority. Where before the scientific revolution, natural disasters, war, disease, and poverty could easily be explained as by-products of sin and demonic forces, now these explanations were no longer believable. The statement that theology and science share a common interest in questions such as the origin of the universe could be true, but there ends the commonality. Legitimate scientific discoveries are driven by strong individual curiosity and doubt. The church’s scientheological research is driven by orchestrated attempts to harmonize dogma. Where true scientific research is concerned with tangible results and the generation of derivative value such as useful technology, the Vatican’s scientific examination produces explanations to questionable theological concepts such as the redemption of aliens. For a scientific theory to flourish, everything must be open to examination; the observer must constantly reevaluate the universe and construct models that better fit his observations. This almost cannibalistic process results in the wholesale destruction of old theories (most serious scientists no longer advocate explanations that are based on theories such as the aether or the four elements). But for the church, this constant construction and deconstruction of ideas makes it impossible to maintain a consistent position on any subject. Being fully aware of the pending doom, they fought tooth and nail to preserve the status quo by enforcing models like the Ptolemaic system. From the historical prospective, it is interesting to note that Galileo’s scientific revolution coincided with several critical events in the 30 year war. The Vatican quickly realized that the opening floodgates of scientific reasoning coupled with significant changes in the European political map would pose major threats to its hegemony—a fear which within 50 years (starting with the treaty of Westphalia) became a reality upon the birth of the sovereign nation-state and the rise of the secular society where science and free speech would thrive. Not having an effective antidote, the Vatican concluded that the Counter-Reformation did not work and the only cure to halting the pandemic spread of scientific thought was the re-mobilization of the Inquisition, the Jesuits, and a new edition of the Index of Forbidden Books containing writing by such troublemakers as Giordano Bruno and Johannes Kepler. Pope Pius XII, in his speech to the Pontifical Academy of Sciences, described Galileo as being among the “most audacious heroes of research … not afraid of the stumbling blocks and the risks on the way, nor fearful of the funereal monuments”. Pope John Paul II admitted the Church had made a “tragic mistake” in rejecting Galileo’s views and offered Galileo a sincere apology. Joseph Ratzinger, (at the time still yet to become Pope Benedict XVI), described the Galileo affair as “a symptomatic case that permits us to see how deep the self-doubt of the modern age of science and technology goes today.” He then quoted Paul Feyerabend, saying “The Church at the time of Galileo kept much more closely to reason than did Galileo himself, and she took into consideration the ethical and social consequences of Galileo’s teaching too. Her verdict against Galileo was rational and just and the revision of this verdict can be justified only on the grounds of what is politically opportune.” Cardinal Ratzinger further commented about Galileo’s trial and concluded that it was “fair and reasonable”. I encourage you to reconcile these statements. If you do, please drop me a line and I will do my part to ensure that in the future, your statue too gets erected in the Vatican. Where specifically, you ask? Why, right next Galileo’s.